It may have been Friday the 13th, but it was one of my luckiest days. 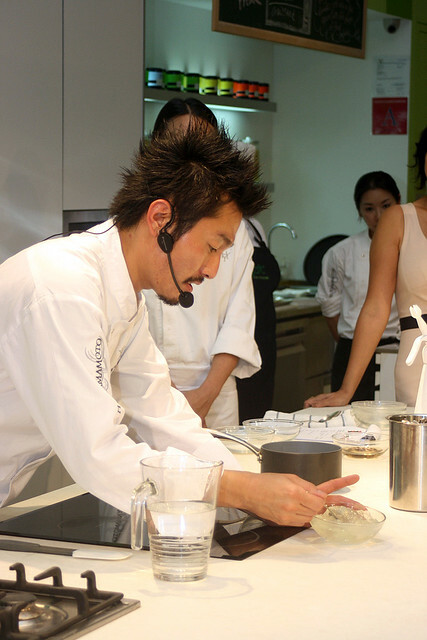 You all know my love affair with all things Japanese (food, culture, history, architecture, sense of aesthetics, unparalleled dedication to detail, etc...), so I was thrilled to be able to attend the Masterclass with Sho Naganuma, presented by DBS Indulge. There is a masterclass every month featuring a different chef. I'd missed last month's class with Andre Chiang because I was out of town. 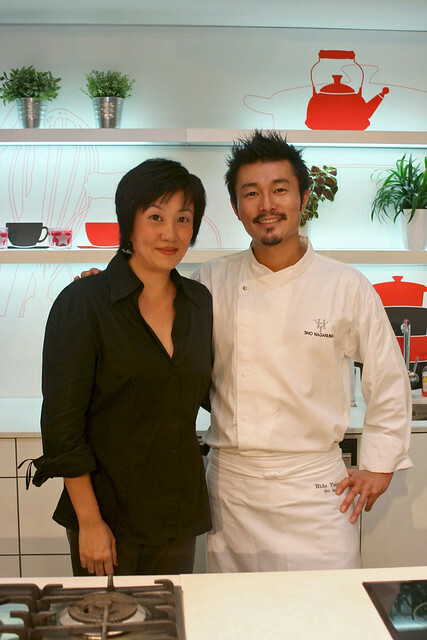 However, Andre I have seen in person and he's amazing, but I had not met Sho yet. So I was very happy to attend this one. 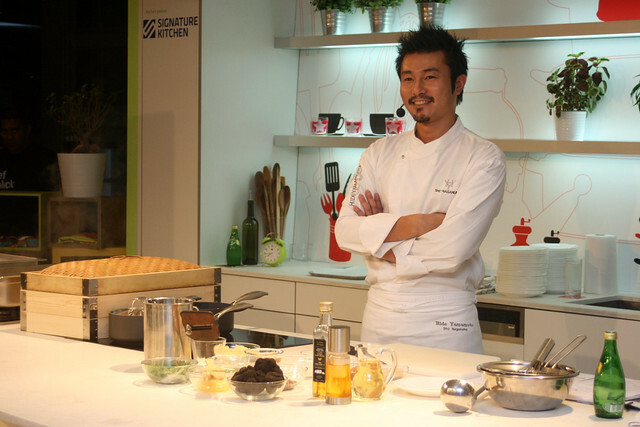 He is the very charismatic executive chef of Hide Yamamoto (8 Bayfront Avenue #02-05, Marina Bay Sands (MBS); Tel: +65 6688 7098), the multi-concept eatery featuring sushi, teppanyaki, robata, ramen and a sake bar. Of the various celebrity chef restaurants at MBS, this is one I haven't tried but have heard good things about it recently. But back to the class! 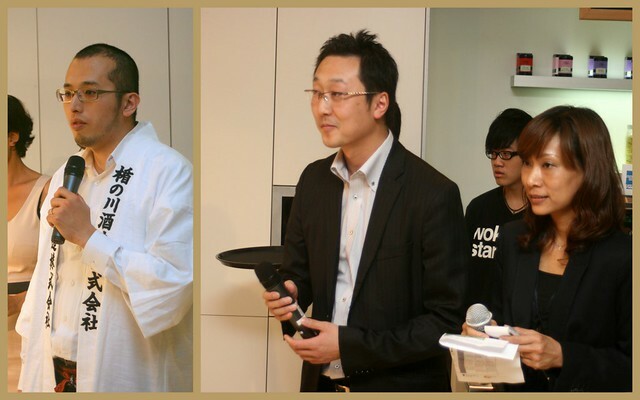 Sho Naganuma presented to a full audience at the AFC Studio (181 Orchard Road, #07-02 Orchard Central, Singapore 238896; Tel: +65 6834 4829). 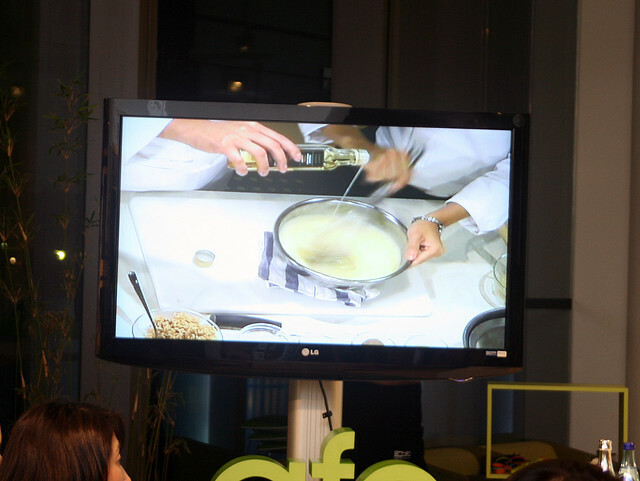 You may have seen some of the trailers on the Asian Food Channel (AFC) too. I will give a short photo walkthrough here, but full recipes are at the end. We started with preparations for the baby poussin which needed time in the oven. Here we have the stuffing made from Japanese rice that's been cooked with chicken stock, soy sauce, unsalted butter. 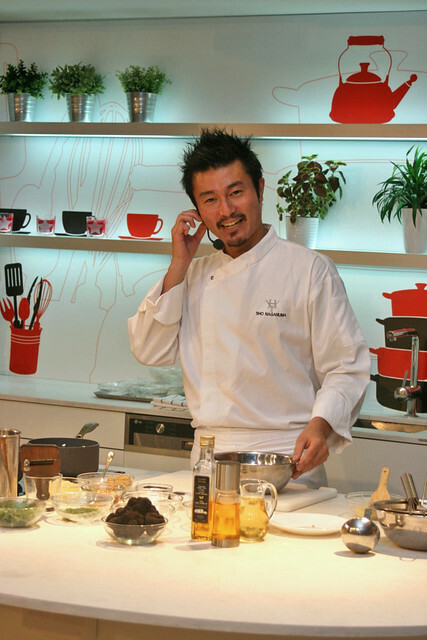 By the way, Chef Sho presented in English, which he speaks really well, having spent time in the United States. 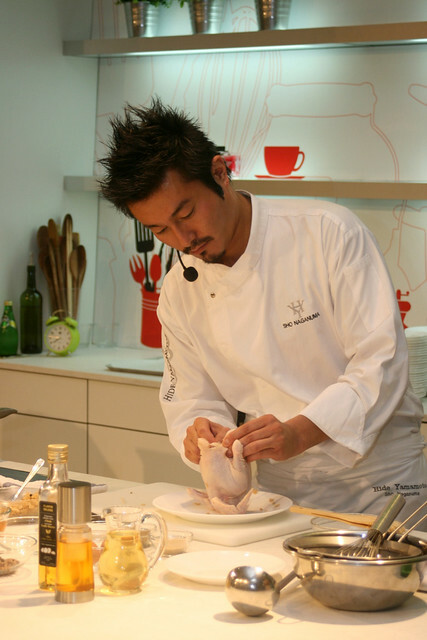 He first met Chef Hide Yamamoto in Los Angeles in 2002, and then they worked together at the Mandarin Hotel in Washington DC. 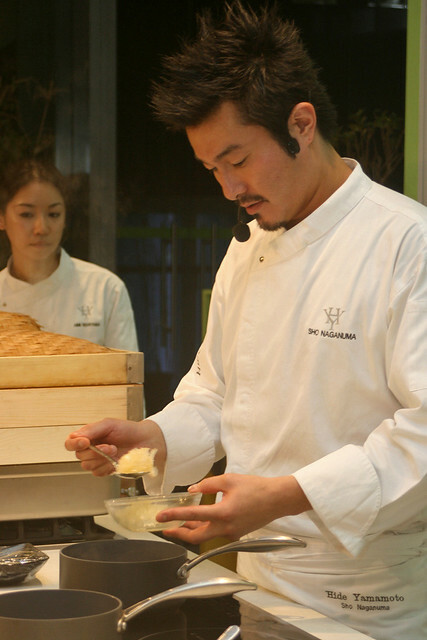 They also teamed up for the prestigious opening of the Mandarin Oriental, Tokyo. Stuff the rice into the baby poussin (young chicken), and seal up with toothpicks. Brush on some duck fat (or any fat you prefer). And finish off with a slight sprinkle of salt on the chicken. Not too much, because the chicken has already been pre-soaked in 3% salted water. Someone in the audience asked how to get 3% salted water. Well, water is 1kg per litre. So you can easily measure 30g salt per litre for a 3% solution. Pop it in the oven (250 degrees C) for 10 minutes on each side. Next up, we have the chawan mushi. A seemingly simple and commonplace dish, but he transforms this into something utterly divine with just a simple treatment. Yes, truffles! 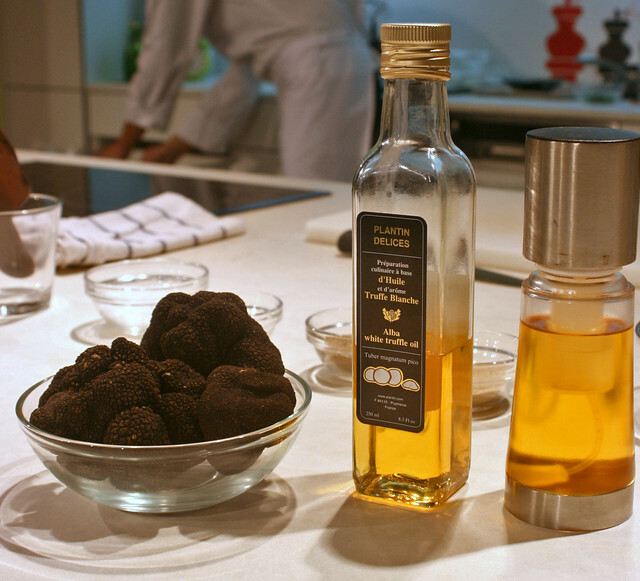 You can't help but notice the stars of the ingredients...whole black truffles and white truffle oil! My kind of magic mushrooms! Yes, lots of white truffle oil going into the egg mixture! Blend the eggs, dashi, white soy sauce and the white truffle oil (you can use a whisk and bowl). Someone asked what "white soy sauce" is. It's shiro shoyu (白醤油), made mostly of wheat and less of soybeans. It's much lighter in colour and also sweeter in taste. Usually used for steamed or simmered dishes that you don't want muddied brown by regular soy sauce. Strain the mixture and steam it for 5-10 minutes. 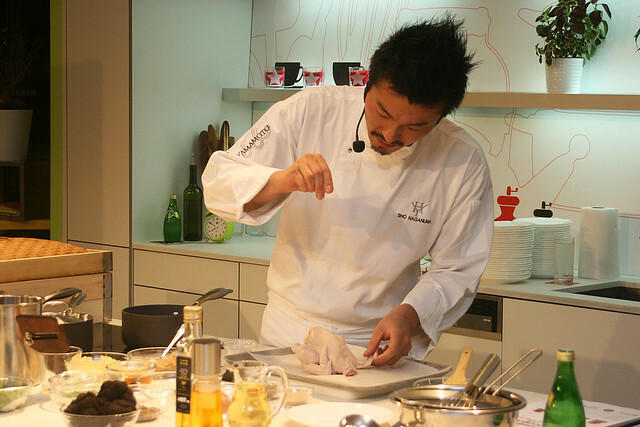 While the egg mixture is being steamed, you can prepare the shark fin broth using chicken stock and Japanese leeks. You can use any ingredient you like, not necessarily shark fin. Spoon this on top of the egg once it's done steaming. Top with chives or any garnish you like. This is hands-down the BEST chawan mushi I've ever had. So beautifully smooth, soft and aromatic! Now I really need to get some of that white truffle oil. 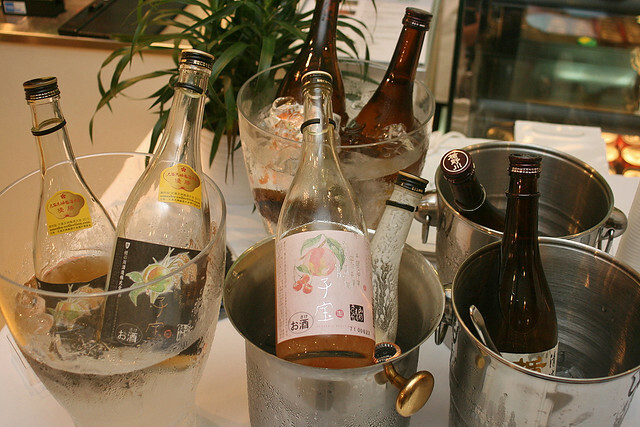 Together with the food, we had some sake pairing from Tatenokawa, Inc., a brewery from Yamagata, Japan. Their sake tastes really refreshing. I particularly liked the Kodakara "Daiginjyo Umeshu" (bottom left), the Kodakara "Peach & Cherry" and Kodakara "Yoghurt" (bottom middle) which they recommended to be taken side by side. Yoghurt sake - that's a first for me! They also have a very special Tatenokawa "Nakadori Junmai Daiginjyo", a very clean-tasting premium sake. The sake master and brewery representatives also happened to be in town, so it was a pleasure having them there to give us more detail about the sake types. All right, the chicken is ready! 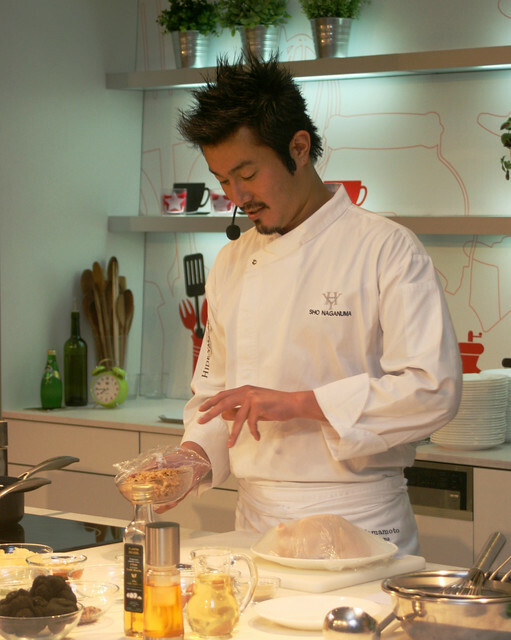 Chef Sho removes it from the oven. The smell is gorgeous. Baby poussin hot from the oven! Normally he finishes it off with a charcoal grill (imagine the extra crisp browning!) at Hide Yamamoto, but since we don't have that equipment here, this is the finished product, which is still very good. 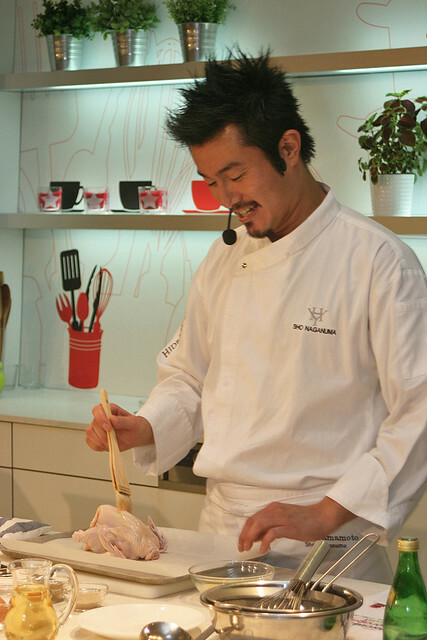 And here's a video of Chef Sho demonstrating how he debones the chicken and finishes it off for serving. Check out how generously he shaves the black truffles onto the final dish! And voila - Grilled Baby Poussin with Buttered Soy and Truffle Rice. Simple yet luxurious and elegant. Dessert proved to be the most complex dish. You had to squeeze yuzu, make jelly, boil strawberries with sugar and pectin for compote, prepare tapioca pearls, and make strawberry shake soda with sherbet and soy milk. 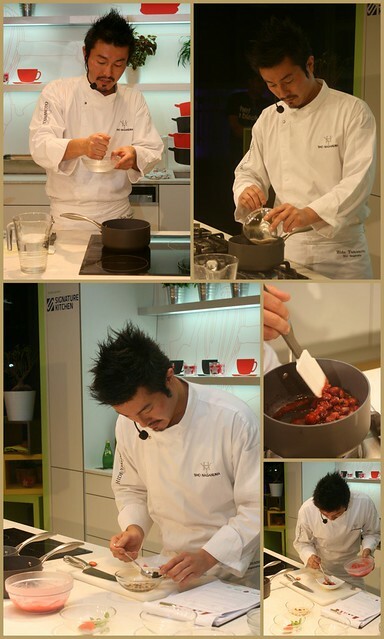 For the yuzu jelly, he uses gelatin, but says you can use agar if you prefer a vegetarian option. That's helpful for halal purposes too. Someone asked if carrageenan was a good substitute as well, but it's not been tested for this recipe. 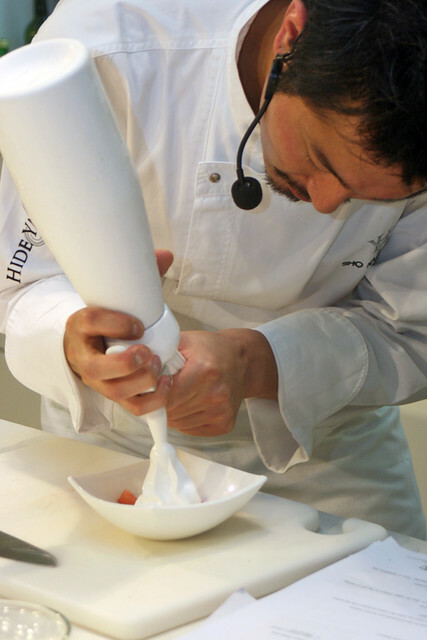 The innocuous yuzu jelly that Chef Sho is scooping here is about to make a huge transformation. And this is where the dessert crosses the line from being "easily replicated at home" to something best made in a restaurant. Mainly because of one equipment we probably won't have sitting on our home kitchen counters. The Espuma (foam) canister and pump sprayer with CO2 (carbon dioxide) chargers. Yes, this white bottle with strange nozzles. In goes jelly and out comes...this remarkable creamy foamy thing! Yuzu Fizz! It's like cream but with a delicate tingly fizz! We were absolutely floored. So here you have the very cutely named "Pinky Chick" - Strawberry Soya Milkshake with Tapioca Pearls, Yuzu Fizz and Strawberries. 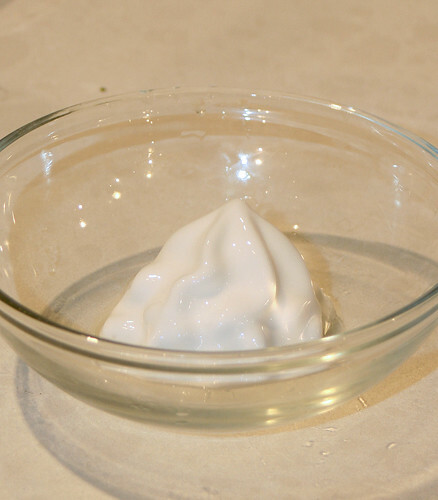 The foam does dissolve pretty quickly, so don't tarry too long! The full recipes are below. You can cut and paste the text to print out for easy reference. 1) Blend eggs, dashi, white truffle oil and white soy sauce. Strain mixture into a bowl and chill. 2) Chop black truffle and add into the chawan mushi mixture. 3) Steam chawan mushi at 90 degrees C for 5-10 minutes (depending on how large your bowls are). 1) Heat chicken soup, Japanese leek and shark's fins over medium heat until the original amount has reduced by 50%. 2) Add potato starch to the reduced mixture to thicken further. 3) Add salt and white soy sauce to taste. 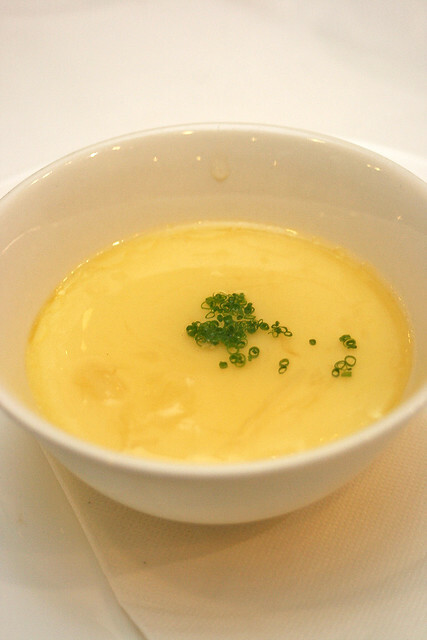 Spoon the shark fin broth onto the steamed egg and garnish with chopped chives. 1) Clean poussin and soak in 3% salted water for 2 hours. 2) Once poussin is soaked, remove from salted water and dry. 3) Put Japanese rice, chicken stock, soy sauce and unsalted butter into a cooking pan and stir well. 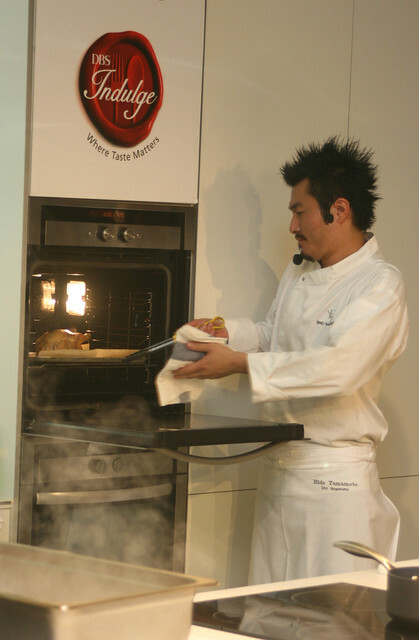 Allow it to steam in the steam oven at 100 degrees C for about 30 minutes. 4) Remove mixture from oven and stuff into baby poussin. 5) Brush duck fat over baby poussin and finish off with some salt. Cook in oven at 250 degrees C for 10 minutes on each side. 6) Finish up with charcoal (grill) until poussin is nice in colour. 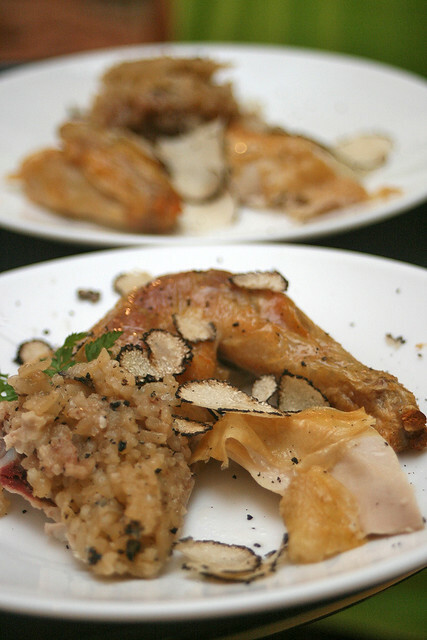 7) For plating, take a portion of the poussin and assemble with sliced fresh truffle. Spray with white truffle oil and serve. Equipment: CO2 (carbon dioxide) chargers (Espuma Canister, Pump Sprayer) - it's available at Sia Huat, but probably not meant for home use! 2) Bloom gelatin leaf in ice water and add the bloomed gelatin into the yuzu mixture. 3) Set the mixture in the chiller for 3 hours. Once set, break the mixture and pour it into the siphon. 4) Charge it with the CO2 chargers and chill overnight. 1) In a bowl, mix sugar and pectin together and set aside. 2) Boil strawberries in a pot until they start to turn soft. Add the sugar mixture to the pot of boiling strawberries. 3) Stir constantly until mixture thickens like a jam. 1) Combine strawberry sherbet and soy milk and whisk until mixture thickens. 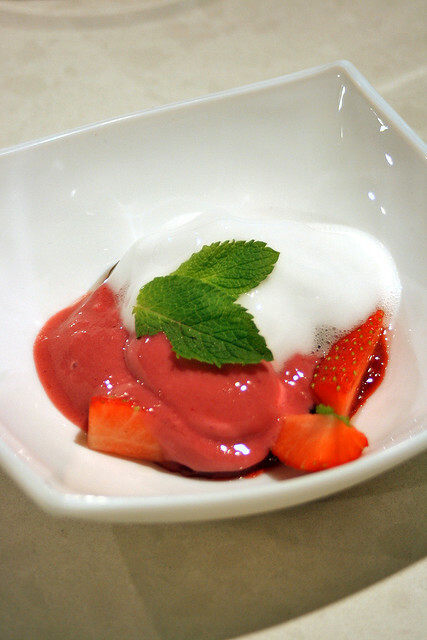 2) For assembly, combine strawberry compote, pearls and fresh strawberries. Pour in strawberry soy shake, followed by the yuzu fizz and garnish with mint leaf. Serve immediately. Full set of 36 photos on Flickr! 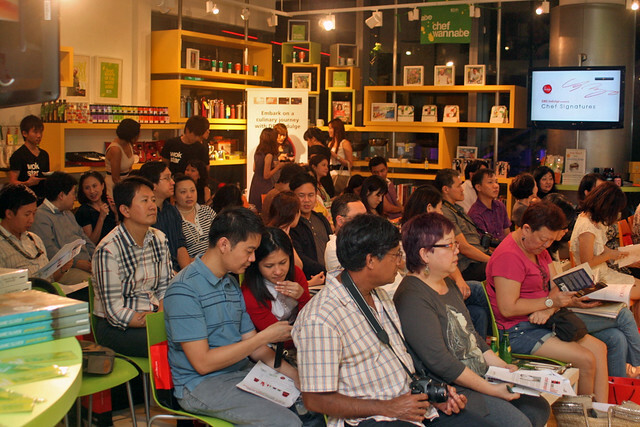 Big thanks to Fulford PR and DBS for inviting me to cover this event! He is really cute! Looks aside, I'd have to say that this is a really unique chawanmushi recipe. It's like a chinese-japanese fusion. I'm not a big fan of shark's fin, but I'm sure it must have been pretty awesome! Jo: oh yes, he is very good-looking! I can imagine the Japanese women there going, "イケメン!!!" Kayla: It was awesome for sure, and to me, it didn't even need the shark's fin to be good. You can use anything you like. I'd just use a splash of the plain chicken stock with leeks. 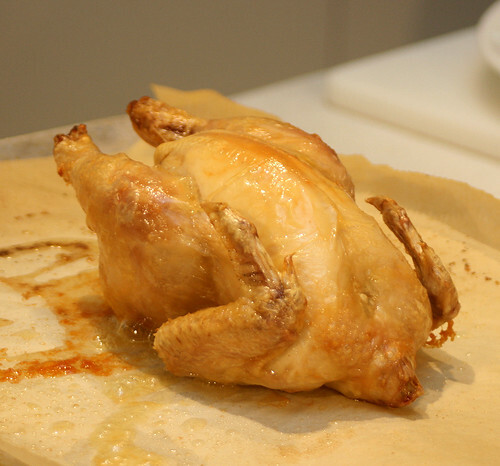 Gonna try out the spring chicken recipe this weekend but where to buy duck fat? What to replace? Other than duck fat? In a pinch, butter works just as well! Sho says any fat will do. But I think you can get duck fat at some of the gourmet deli stores. :((( the fresh truffles are expensive!!! Any idea where to source one @ gd rate? wish he replaced shark fin broth with other ingredient that has the same taste as shark fin broth.